Surrounded by his family, Cinnaminson’s new chief of police, Richard Calabrese, is sworn in by Mayor Ernest McGill at a regular meeting of the township committee. 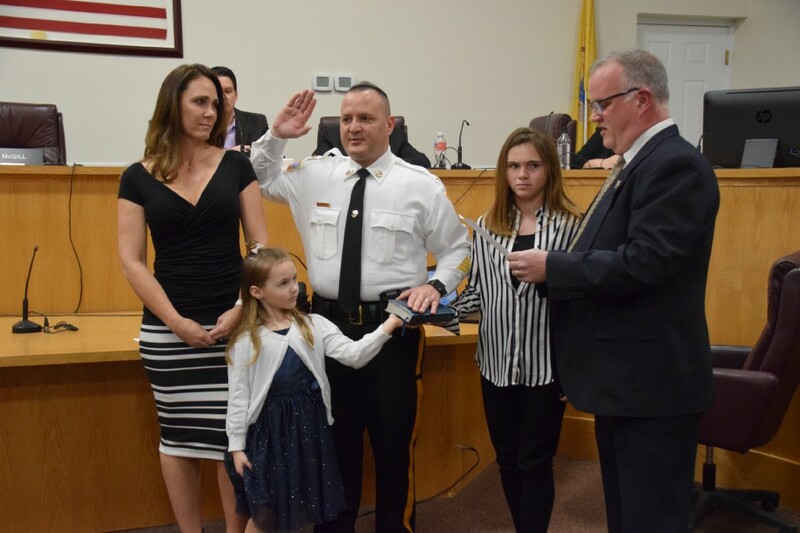 Cinnaminson Police Lt. Richard Calabrese was sworn in to serve as chief of police by Mayor Ernest McGill last Monday during the township committee meeting. The establishment of a new chief of police marked the end of an eight-year stretch for the township without an officer holding the title. In 2011, Cinnaminson switched to a director of public safety arrangement after a number of senior police officers retired. “The township committee feels strongly that a chief of police is the position which should lead the Cinnaminson Township Police Department. Unlike a public safety director, a chief of police has the authority to participate in all law enforcement activities, including responding to emergencies,” said Township Administrator Eric Schubiger. Police Chaplain John Doll began the proceedings, anointing the new chief’s badge with oil and praying for blessings and protection for all who wear a badge. Schubiger also pledged his support for Calabrese and the police department as a whole. According to Schubiger, Calabrese possesses a long list of qualifications that pushed him to the top of the list of candidates. During his career in policing, he has served in the ranks of patrol officer, detective, patrol sergeant, detective sergeant, lieutenant and officer-in-charge. He has also served in other important roles, including field training officer, forensic analyst and internal affairs commander. Calabrese holds a master’s of science degree in administrative science and continues to pursue educational opportunities. After he was joined at the front of the room by his family, and sworn in by McGill, Calabrese had an opportunity to address the people who came out in support of his appointment. “This is a very humbling experience for me. The road to achieving this professional goal has been challenging, educational and enlightening. I want to take what I have learned from this experience and build upon the foundation of what makes the Cinnaminson Police Department a shining example of municipal law enforcement,” said Calabrese. The new chief said his vision for the department is to promote transparency, communication and professionalism. He plans to achieve this vision by way of a team approach and focusing on three specific areas: building trust and legitimacy with local youth, utilizing more technology and social media to better engage with residents and ensure they are properly informed, and building on established community policing initiatives by working more with residents to help co-produce public safety. Going forward, Calabrese will be establishing a new lieutenant to take the place of his previous position and working toward getting his department more involved in the community through events like Coffee with a Cop, National Night Out and Pirate Day.